After reading the back cover, people will either open my book titled The Messenger, or they won’t go near it. The subtitle: The Improbable Story of a Grieving Mother and a Spirit Guide will intrigue some, while others will be put off by it. Those who begin to read it will find that it opens with this sentence: You do not have to believe this story. It happened all the same. I don’t ask my readers to believe it. I simply put it before them, as it was put before me. Half the book is my story as I lived it—the gruesome, heartbreaking experience of the death of my child and its aftermath. The other half was given to me by someone who lived almost two thousand years ago in Egypt: My Spirit Guide, Lukhamen. Let me use the proper term for what happened. I channeled his story. Improbable? Indeed it was. Is. I’ve read about other people who’ve experienced this phenomenon. I have also met some. They were not “woo-woo” people. They were not flaky or inveterate liars. Or con artists. Or on drugs. They were ordinary people with ordinary lives, ordinary jobs, and not particularly imaginative. The first one I happened to hear (on National Public Radio) was a well-known newspaper journalist. As for me, I have lived my own professional life in the company of hard-core realists – engineers, research scientists, and government officials. I spent my entire career in Washington, D.C., interrupted only by a brief stint as a diplomat in Brussels. My life was lived in two centers of government that are about as far removed from metaphysical philosophies as ever I could imagine. I was, and still am, tremendously impressed with intelligence and the scientific mind that is driven to explore the unknown, the unknowable, and the unbelievable. But let me stop there. I am not an apologist for channelers or channeling. It is, as they say, what it is. What I would like to do is answer the most-asked questions put to me by my readers. I believe I should include these in an introduction to The Messenger II. (I’m working on a sequel.) The questions are, WHAT WAS IT LIKE? And HOW DID IT HAPPEN? To answer the first question, the best explanation I can give is that it was like looking at television. Imagine that you are watching, say, a soap opera. (That is so unfair to my Spirit Guide, but it is a commonly understood form of a continuing story.) Each segment is just a few minutes long. You turn off the television and write down what you heard and saw. It was almost just that simple. Except that I was looking at television with my eyes closed. The story would always resume where it left off. Like soap operas do. One negative reviewer (gratefully, I’ve only gotten one so far) questioned my ability to recall conversations. He just chalked the whole thing up to the conclusion that I invented the whole thing. I must say I’m flattered that he would credit me with the massive imagination it would have taken to dream it all up plus the fiction writer’s gift for concocting a complicated plot. Many of us can recall (more or less) scenes from our favorite movies. How many of us can remember the lines from a famous airport scene that ends with, “Here’s looking at you, kid?” Can you see the hat Ingrid Bergman is wearing? Can you see the tears in her eyes? I can. And how did such an extraordinary, improbable thing happen? It happened because I requested it. Now, when I think of it, it was more like a prayer. I asked for a Spirit Guide to come to me, to help me. I was at the end of my rope and nobody had yet made me understand why my young son had to die. I asked and I received. I asked and Love answered. The truth that I will ask my readers to believe comes at the end of the book. And it is this: There exists a Love that is greater than any of us can imagine. It will find us in the darkest hour. There is a light in the night for all who mourn, and death is banished. Life is all there is, and love is greater than fire, and wind, and time. Helen Delaney is in a railway book store, inconsolable and suicidal after the death of her son. A book at eye level catches her attention. She touches it, and it falls off the shelf, into her hand. It is a set of instructions on how to connect with a spirit guide. 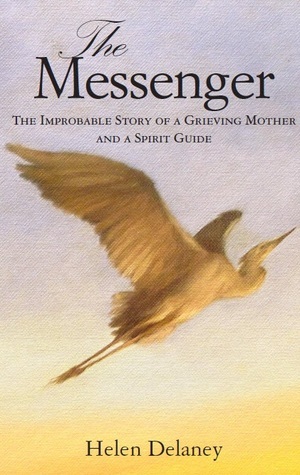 Thus begins The Messenger, the true, intimate story of a grieving mother, a gifted medium, and the spirit guide Lukhamen, who keeps her alive by recounting the story of his life. Hanta Yo is a Lakota Sioux term that means “clear the way.” It indicates the intention of drawing on the Great Spirit to clear the way while you do your part with faith. According to a book I am reading written by a master acupuncturist, when physical pain is relieved, underlying emotional pain often rises to the top, and takes its place. My physical pain was in my neck and shoulders. Neuromuscular therapy eliminated a lot, but the therapist told me there was more stress to be addressed. I can feel it. Am I stressed? Yes. My house has been on the market for two years. I’ve had three offers that did not go to settlement. Strangers are still roaming through my rooms and peering into my closets. It’s a pain in the neck. And then, there was my heart, beating through my ear. I saw an ENT physician, who identified the throbbing as a blockage in the Eustachian tube. He has prescribed a nasal spray. Was my heart trying to speak to me? Was it whispering in my ear? The center beam under my house has come up in two home inspections. According to the inspectors, it should be bolted to two parallel joists and they need to be reinforced. And I’ve been resisting it. Early on, Bill and I decided to deal with it (it was like that when we moved in) by installing steel beams and later, I installed new joists all over. The house is, without a doubt, structurally sound. But the home inspectors see it and note it. It freaked the second buyer out. It’s like a sore thumb. Or a pain in the neck. In the last few months, I’ve grudgingly made some needed repairs – I replaced two windows, took care of a plumbing problem, and re-painted the deck and the porch. But I have stubbornly refused to have my house jacked up again (my granite counter top cracked last time) to fix that *###** beam. Not to mention the money. Yesterday, I had it fixed. I surrendered. And as the acupuncturist predicted, when I took care of the physical pain in the house and in myself, the emotional pain surfaced. It came upon me as I was walking the river road. (For those of you who have read my book, there is a river road here, too.) It came upon me because I realized that this house was mine and Bill’s. This is where we sat on so many precious mornings at the kitchen table, talking about everything in the world. It’s where we celebrated Christmas, birthdays, Mother’s Days, Father’s Days. It’s where we watched the fireworks on our river on the Fourth of July. It’s where we fed our children, our grandchildren, and our friends. It’s where we laughed. And cried. On those last few days before he took to his bed, Bill would sit on the back porch and look at the trees and the garden I had made as if it were the most beautiful thing in the world. And I was glad, because I had created it for him. And finally, on that day in August six years ago, Bill passed into spirit here. In his bed, in his home. In our home. In our house. Tears blinded me as I made my way back. My house would not sell as long as I would not let it go. Perhaps I am letting it go now. Finally. Perhaps I am drawing on the Great Spirit to clear the way while I do my part with faith. 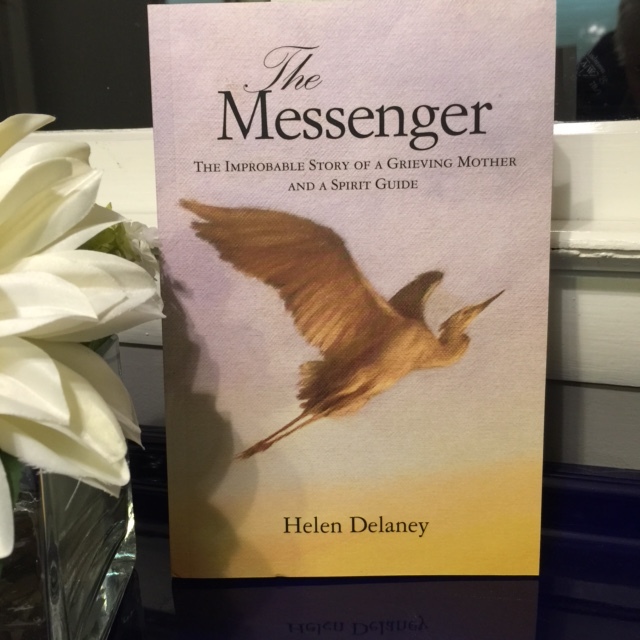 Helen Delaney’s book, The Messenger: The Improbable Story of a Grieving Mother and a Spirit Guide, is available on Amazon. You may find it by clicking on the link below.